Trimming your beard is no child’s play. It’s a serious business that requires quality grooming tools and a sturdy hand. Many men like to trim theirs at a barbershop for supreme quality, but with some good gear, most of your basic beard clipping, cutting, and trimming can be handled at the privacy and comfort of your own home. To help you not colossally mess up the results, we built up this review of the top ten best choices of banger quality trimmers and trimmer kits for helping you sculpt out your favorite beard styles with ease. Buying a beard trimmer is something you shouldn’t do in a rush. After all, quality facial hair clippers can last you nearly a lifetime. If you get something that’s versatile, durable, and – most importantly – pleasant to use, time and time again, you can significantly boost your life quality. Not to mention the quality and style of your precious facial hair. So before you do the mistake of jumping in and buying something without taking a closer look, let’s quickly go through what to look for when buying a beard trimmer, so that you actually know what you’re getting. Corded or cordless? Some men like their facial hair trimmers to have the cord, while others enjoy the battery-powered kind. Some trimmers have a charging station and others can be used while the cord is in place. The length of the beard. Your beard length is an important factor when choosing a trimmer. Some offer a noticeably closer and sharper shave, while others leave a noticeable stubble. We also have a review of the best stubble trimmers. Beard thickness. Some men have so thick, coarse, and curly beards that the weaker battery powered motors simply don’t have it in them to get the job done. If this is you, consider the more heavy duty options. Do you travel a lot? If so, you might want to look into Lithium-ion battery powered minimalist style beard trimmers with international voltage use (most commonly either 110v or 220v). The ER-SB40-K is the flagship model of the Panasonic beard trimmers. Depending on your needs, it may as well be the best beard trimmer for you. These are some of my personal favorites when it comes to beard clippers, and the first thing you will notice – after seeing the pleasant design – is the weight of the trimmer; at 2.99 oz the Panasonic ER-SB40-K is incredibly light and easy to maneuver. As a somewhat minimalistic person, I was also very pleased to notice that you will not get a big bag full of different attachment heads and guards with this beard trimmer. Instead, you get one high-quality guard comb that can be adjusted to 19 different lengths from the quick-adjust dial in the middle. 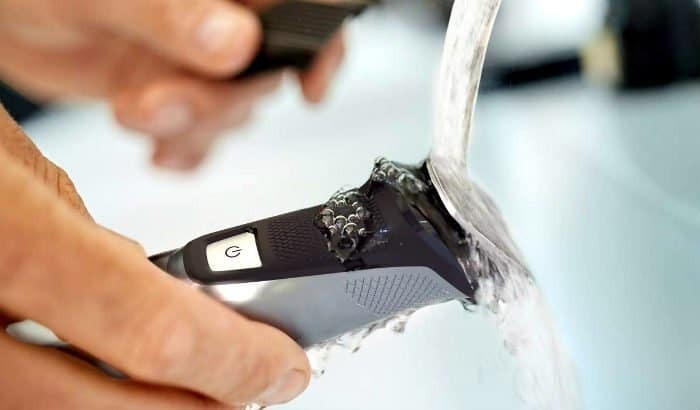 This is also one of the easiest beard trimmers to clean, as its waterproof enough to clean under the faucet with running water (provided that you disconnect it from the electric outlet). The best part is the power. 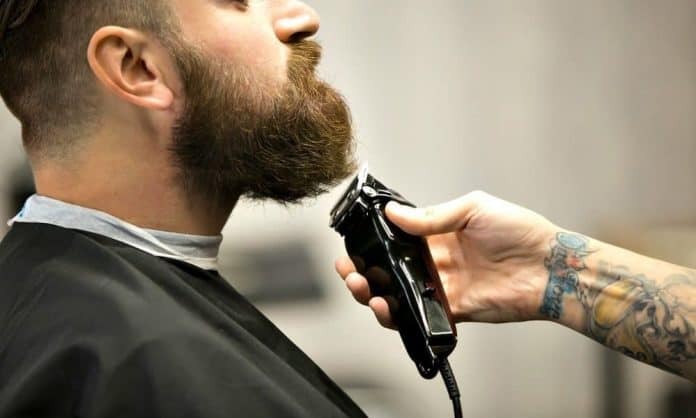 Panasonic has fitted this trimmer with a 9800 cuts-per-minute (CPM) linear trimmer motor that is strong enough to cut and groom even the thickest and longest beards. The blades are made from hypoallergenic stainless steel and come with a wide cutting edge and rounded tips, which allow you to edge out sharp and clean beard lines effortlessly. Adding in the fact that this high-quality beard trimmer comes with Li-ion battery and a dual LED display, there’s really a lot of positives and not a whole lot of negatives that come to mind when looking at the Panasonic ER-SB40-K.
One of the most powerful beard trimmer motors available. Extremely lightweight and easy to maneuver on the face. Easy to adjust quick-lock guard mechanism without multiple guard attachments. High-quality lithium-ion battery with 1-hour charge time and 60 minute trim time. 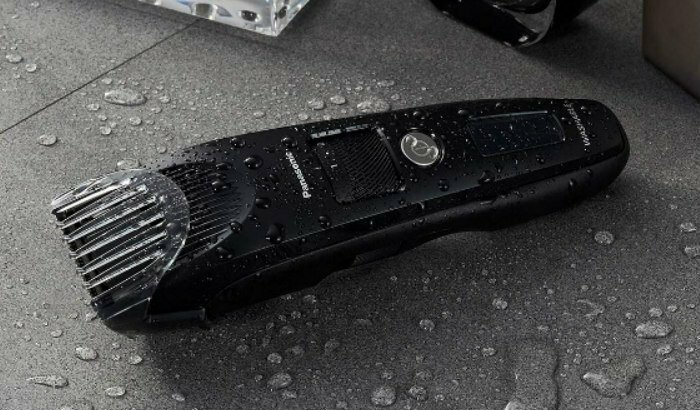 IPX7 waterproof, allowing for effortless beard trimmer cleaning under running water. Can be used corded or cordless with universal voltage (100-240V) and travel adapter. One of the more expensive beard trimmers on the market. Pure facial hair trimmer with no extra body grooming, ear, or nose attachments. Wide blades are convenient but make small detail work harder than it needs to be. Key Features: Li-ion battery, waterproof, LED-display, adjustable guard, stainless-steel blades, high-performance linear-drive motor, lightweight, ergonomic, flagship. The Wahl 9818 Li-ion Plus beard trimmer gives good competition to the Panasonic ER-SB40-K. In fact, before updating this article, I used to have this as the #1 best overall beard trimmer for men. What makes it so good is the simplicity and ease of use with premium quality material selections. The 4-in-1 beard clippers come with a wide T-blade trimmer head, smaller detail shaver attachment, a mini precision detailer, and the commonly seen ear & nose trimming attachment. The stainless-steel housing holds inside a powerful motor that can cut through medium-thick facial hair with ease, and the Li-ion+ battery gives out 4 hours of trim time with just a 60-minute full charge. There’s also a quick-charge option, with just 1-minute charge providing you 3 minutes of run time. Wahl is the most used brand by professionals, and one of the areas they are often held in high regard is the blades. The 9818 Li-ion+ comes with Wahl’s patented self-sharpening blade technology which makes sure that your trimmer won’t get dull even after years of use. Of course, no beard trimmer is perfect, and these clippers do have some negative qualities as well. One of these is the fact that it has no adjustable guard, which means that the trimmer comes with twelve different non-adjustable plastic guards. All of this extra guard storing and changing feels like a drag after using the adjustable guard of the Panasonic ER-SB40-K beard trimmer mentioned above. The best Lithium-ion battery available in the beard trimmer market. Sleek and minimalistic stainless-steel design allows for smooth maneuvers. Self-sharpening blades won’t go dull & the high-torque motor prevents snagging. Has dual-voltage international use (110/220V) and storage case for traveling. Even though it looks small and sleek, it’s still 12.8 oz in weight. No adjustable guard means that you have to store and constantly change plastic guards. Key Features: Li-ion+ battery, stainless-steel blades, long battery life, quick-charge, ergonomic, minimalistic design, made in the USA. Braun is one of the most trusted beard trimmer makers there is, and their all-in-one beard, hair, nose, ear, and body grooming kit is impressive, to say the least. The trimmer itself has a really nice and sleek design, which holds in a powerful motor powered by a Ni-MH battery, which is actually sub-par compared to the Lithium-ion alternatives but still provides a nice 50 minutes of trim time per each full charge. The blades are high-end and as precise as they get. Braun is known for their quality in this area so you can be certain this trimmer gets through thick and coarse facial hair with ease. Where this trimmer kit really shines is in the length adjustment options. With the guard combs that come in the package (two adjustable ones and two non-adjustable kinds) you essentially have 39 different length options to choose from anywhere between 1 to 21 millimeters. The kit also contains attachments for contour edging, precision detailing, ear & nose trimming, and it comes with a Gilette Fusion Pro shaver that you can use for clean-shaven parts like the neckline and cheek line, or even the cheeks if you’re going for a goatee. All-in-all, the Braun beard trimming kit is one of the best medium-high price range facial hair clippers you can get, and it definitely deserves this high of a spot in our ranking. The electric trimmer engine is powerful enough to cut thick and long facial hair. One of the few “all-in-one” clippers that truly do what they claim to do. The impressive 39 different length adjustments make it the most versatile trimmer. Ni-MH battery is sub-par compared to Li-ion that is available with most competitors. Key Features: Washable, a trusted brand, multiple length adjustments, cordless/corded use, good for sensitive skin. 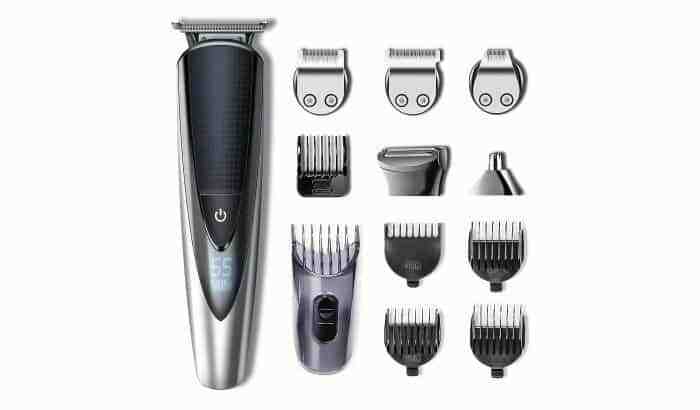 The Philips Norelco is one of the best-selling and most liked trimmer series of all time, and the MG7750 multi-groom kit is the flagship in that lineup. The trimming kit comes with an impressive 23 pieces for all the facial hair, head hair, and body grooming needs you might have, not to mention the fine detailing work, the ear & nose grooming, and yes, there’s even a guard comb for eyebrow trimming. Many brands toss out the word “all-in-one trimmer”. The MG7760 is one of the few beard trimmers that can legitimately call itself such. Of course, the massive amount of attachments can be a negative quality for some users who would rather like a minimalistic approach with an adjustable guard, but to each in their own. Philips boasts that they use their best blade structure in the Norelco MG7750 with a patented “DualCut” self-sharpening stainless-steel blades. The blades are housed in a nice and light stainless-steel frame that is detailed with an anti-slip rubber on the area of your index finger and thumb. Somewhat of a staple among higher-end beard trimmers is the use of a Lithium-ion battery for power. The Norelco MG7750 is no exception, as its powerful Li-ion power unit can give you a whopping 5-hours of trim time per each full charge. For additional convenience, you can use the trimmer with the cord plugged in as well. The electric motor has plenty of power to cut through coarse and long facial hair, making the Philips Norelco MG7750 possibly the best beard trimmer for long and thick beards. The trimmer and all of its attachments are also fully washable, which is nice and somewhat expected by now as most brands are forced to adapt to the new standards of competition. Powerful electric motor easily cuts coarse and long facial hair. The self-sharpening blades are precise and won’t go dull even after years of use. The attachments and comb guards are sturdy and the clamping mechanism is stable. Truly an all-in-one beard trimmer with attachments and guards for any grooming need. No adjustable guards or sliding lock mechanism causes “attachment bloat”. Even if you wanted to, you can’t purchase extra guards or an adjustable guard. Key Features: Washable, powerful electric motor, a trusted brand, flagship product, extremely versatile, cordless/corded, stainless-steel blades. 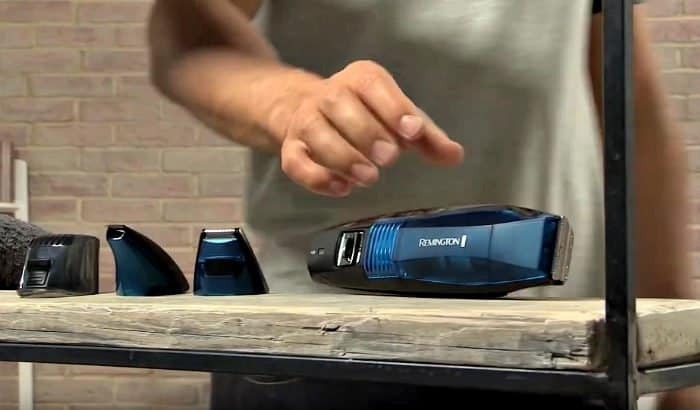 If you are looking to reduce the mess left behind by the beard cut, you may want to opt for Remington’s vacuum beard trimmer, which collects all the clippings while you use it. The chamber can then be removed and the contents dumped into a bin. Remington claims that their vacuum beard clippers “sucking power” is roughly 2x more powerful than that of their competitors, but such details tend to be only important to the brands battling against each other, not so much to the customer. This “4-in-1” trimmer comes with the normal beard clipper blades, a close-skin foil shaver head attachment, an attachment piece for ear & nose hairs, and a smaller detailer piece. When it comes to trimmer length adjustability, the Remington VPG6530 vacuum beard trimmer comes with a larger adjustable guard comb with 9 different length settings and also 4 fixed length guards for shorter beards and stubble. 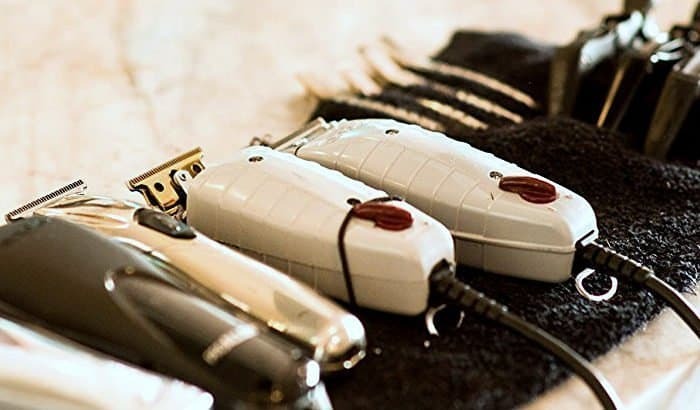 The trimmer can be used with or without a power cord, and the Li-ion battery has a trim time of 1-hour which falls right into the average time within the beard clipper industry. Although the manufacturer boasts that this specific vacuum beard clipper model has 3x longer battery lifespan than the average standard beard trimmer battery would last, I find that somewhat hard to believe, especially since many people who purchased this trimmer have complained about its subpar battery performance. Some users also report that the trimmer sometimes pulls the beard hairs mid-cut and the blade motor seems to struggle to keep up at times. I guess its safe to assume that when used in cordless mode, the battery may not be sufficient enough to power both the vacuum and the blade motor if the user has long and coarse facial hair. The best vacuum beard trimmer on the market as of now. Responsive customer support and above average 2-year product warranty policy. Solid all-around clippers with plenty of length settings for the average Joe’s use. Received some recognition like the Red Dot award and British GQ grooming award. In cordless use with longer thicker beards the trimmer sometimes struggles to cut. As with many electric men’s beard trimmers, this one suffers from “bloat” of guards. For this price range, there are some much better products available (without vacuum). Key Features: Vacuum beard trimmer, washable head attachments, cordless/corded use, Li-ion battery, stainless-steel blades. Perhaps the best-marketed beard trimmer as of late has been the OneBlade by Philips Norelco Series. If you’re looking for a small, handy, minimalistic beard tool that can handle all of the basic beard-cutting necessities, then the OneBlade is for you. At 3.42 oz the OneBlade is one of the lightest facial hair trimmers out there. Its blade motor is still fairly powerful and the fast-moving oscillating blade structure provides 200x back and forth movements per second, which makes your beard grooming experience pleasant and snag-free on even the most sensitive of skins. Philips has put in one of the best Lithium-ion batteries in the industry, providing 90 minutes of trim time per 1-hour full charge time. This is a noticeable improvement to its regular version which has a 45 minute trim time with a ridiculously long 8-hour charge time. In my opinion, the Oneblade is one of the best beard trimmers for short beards and stubble looks. It’s sort of a unique hybrid between a stubble trimmer, beard trimmer, and an electric shaver and it does each of the jobs incredibly well. I wasn’t a big fan of the original OneBlade with its multiple guard combs, long charge times and sub-par length adjustments, but the OneBlade Pro seems to have fixed all of these issues and added even more functionality. How did it change you ask? Well, for starters the weaker NiMH battery is upgraded to a powerful Li-ion kind in the pro model, the three short trimming guards that came with the original have been replaced by one adjustable guard attachment with 14 different length variables, and the electric trimmer unit now comes with a digital display. Of course, no product is perfect and the OneBlade Pro unfortunately also has its shortcomings. One of the main ones is the fact that you’ll find this trimmer absolutely useless if you’re trimming a long beard, as the adjustable length settings vary between 0.4 to 10mm. If you take a look at our list of best beard styles, you can see that the 0.4-10 millimeter length selection on the adjustable guard is basically the range that covers short, medium, and long stubble beard styles, but nothing more. The Philips OneBlade Pro is a beard trimmer for short beards and stubble, crossbreed with an electric razor. If you maintain your beard at short length or are looking for a goatee trimmer, then yes, by all means get this one. Incredibly useful for short beard trimming, shaving, goatees, and stubble. Minimalistic design with good battery life and one adjustable guard comb. Powerful anti-snag blades that oscillate 200x per second and cut both ways. For its small casing and light-weight design, the motor is very powerful. If you’re looking to trim a long beard, this “beard trimmer” isn’t good at all. The two sided cutting edge only works in both ways when not using the guard. The head has a nice contour effect, but if not used carefully, it can break easily. Key Features: Cordless, Li-ion battery, oscillating blades, a trusted brand, good for stubble, best trimmer for short beards, good for sensitive skin. The Hatteker Men’s all-in-one Trimmer Kit is the best budget beard trimmer option we have in this list. Behind its low price is an impressive array of value and functionality. This cheap beard trimmer comes with a selection of five different blade attachments; beard attachment, hair attachment, precision detailer, ear & nose attachment, and a body groomer. On top of this, the clipper kit comes with five adjustable guard combs. The Hatteker clippers also come with a digital screen display which shows much of the lithium-ion battery’s 60-minute charge is left. The unit can be charged via USB and as a pleasant surprise, this beard trimmer is waterproof. Of course, this thing isn’t perfect, and like many cheap budget beard trimmers, it will end up wearing out and breaking much faster than some of the bigger brands’ flagship models showcased above do. The Hatteker trimmer is manufactured in China, which isn’t a good sign. There are also some negative reviews showing that in a couple of buyers, the thing wouldn’t even turn on when they first bought it. Not to mention the fragile clamping mechanism for changing the attachment heads, or the fact that the electric blade motor is not powerful enough to cut thicker and longer beards. All-in-all, this is still the best cheap beard trimmer there is, and when it works, it seems to work exceptionally well. For an all-around trimmer that works for hair, beard, ears, nose, mustache, and body grooming (and can be used in the shower) you are unlikely to find anything better in this price range. The best low budget beard trimmer available. Comes with a wide selection of attachments and guards. This is a waterproof beard trimmer that can be used in the shower. The lithium-ion battery charges in 90 minutes and has 60-minute full-charge. Made in China and the quality varies. Flimsy head attachment clamping mechanism. Customer support response time is long and the trimmer has no warranty. The motor isn’t powerful enough to handle thick and long beards without pulling. Key Features: Cordless/corded use, waterproof, led display, all-in-one, multiple attachments, self-sharpening steel blades, Li-ion battery, USB-charging. If you have watched any beard trimming videos by barbershops and master farmers on YouTube, you must have seen many of them using the Andis Professional T Outliner. This corded trimmer for hair, beards, and mustache features a powerful high-speed magnetic motor that runs quiet and without overheating issues, assuring a smooth cutting experience. The key feature the Andis beard clippers are known for is their extremely precise and close-shaving carbon steel T-outliner blade, which can be adjusted and easily replaced, making it ideal for heavy-duty professional use. The T-Outliner features a nicely contoured casing and a lengthy 8 ft. cord, which is given, as the Andis detailing clippers were designed for professionals who use it for multiple hours on a daily basis. Although it’s more of a pro barber beard detailer, a handy guy with a need for precise detail and long-lasting quality may still find the Andis T-Outliner useful. Yet, it should be noted that the trimmer works best on short hair & beard for detail work, not as an all-in-one trimmer for longer beards. Even though Andis is seen as one of the top tier brands by barbers, many still claim that the quality of their trimmers has gone downhill in the past few years and that the brand simply isn’t delivering the same “top-notch” quality that it used to. Keep this in mind when you read raving reviews from years ago; they might have changed to cheaper, weaker quality material providers. T-blades provide extremely close and precise trim. Light-weight & contoured casing is really comfortable to work with. Some claim that the “known” Andis quality has declined a bit. Only for detailing work, doesn’t come with guards or attachments. Definitely not the best choice for an occasionally used personal trimmer. Can’t be used as a cordless trimmer (although a cordless alternative exists). Key Features: Magnetic high-speed motor, carbon steel blades, 8 ft. power cord, 11.5 oz weight, gray contoured housing, & used by professionals. The Brio BeardScape is a not so well-known beard trimmer in the medium-high price category. It was recommended to us by many people who seem to be raving fans of the trimmer, which is why we decided to include it in our beard clippers review. Right from the start you can feel and see that it’s not a small trimmer by any means. With the 7.9 oz weight its more than two times as heavy as the Panasonic ER-SB40-K mentioned earlier in this review. 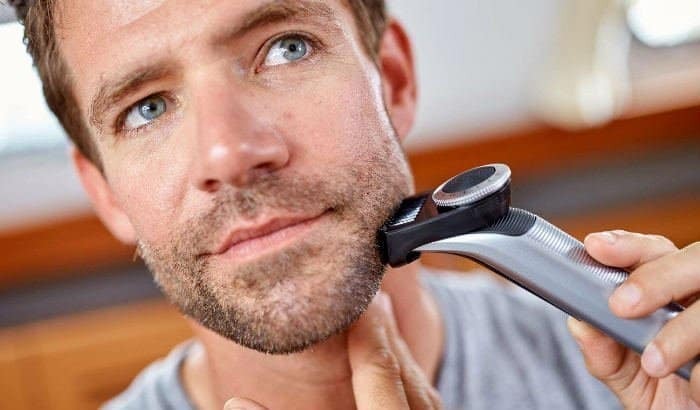 The downside of bulkiness and weight, the BeardScape makes up with a large Li-ion battery that has a trim time of 4-hours, and with a powerful trimmer motor that can easily cut long and coarse facial hair without pulling the whiskers. 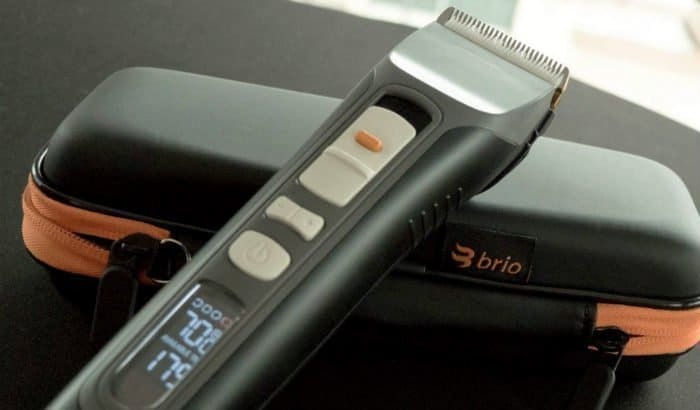 Their main “marketing angle” seems to be the ceramic precision blades and the fact that the Brio BeardScape is one of the quietest beard trimmers on the market as of now. As with many beard trimmers these days, the unit comes with a digital display. There’s also multiple guard combs (1mm, 2mm, 3mm, 6mm, 9mm, 12mm, 15mm, and 18mm) and a 1.0 to 1.9mm blade height adjustment. The design and colors of this beard trimmer make it look much older than it is, and although this doesn’t matter for most users, it’s still a sad fact that this unit simply isn’t up to the design standards of its competitors. Powerful and quiet blade motor with five selections of speed. Extremely high-quality blade design with some extra adjustability. The big Li-ion battery gives an impressive 4-hour trim time with 3-hour charge time. Comes with a nice looking charging stand, and USB-charge option, which is nice. Quite heavy and big beard trimmer to work with, especially for close detailing. The comb guard attachments are two-sided and the clamping mechanism is not ideal. The design has much room for improvement, looks more like a 90’s product right now. The guard comb sizes are all over the place with multiple lengths left out completely. Key Features: Corded/Cordless, extremely quiet, powerful motor, ceramic blades, long trim time, LED-display. Here we have another professional use hair and beard trimmer to accompany the Andis clippers above. It’s the well-known cordless Wahl 5-Star Magic Clip, an electric beard & hair trimmer with an extremely powerful rotary motor and patented zero-overlap blades that are often hailed to be the fastest on the market. These beard and hair clippers also come with a taper lever on the side, which makes fading and blending easier. However, even with such convenient functionality, most people can’t properly fade or blend their edges, which is part of the reason why this is labeled as “professional trimmer”. 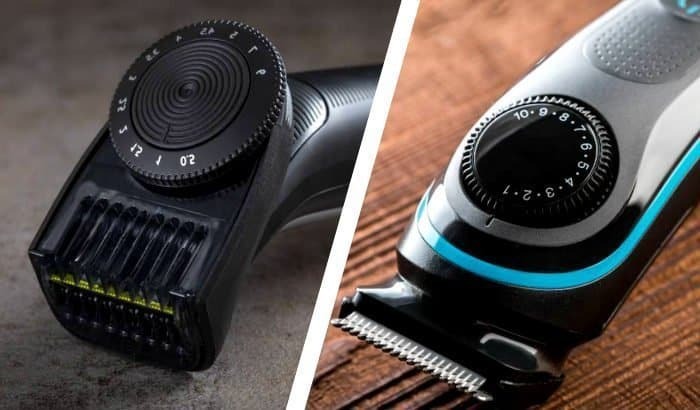 The Wahl Magic Clip is often told to be the best beard trimmer on the market by professional barbers, so why didn’t we rank it higher in our review? Well, simply because 99% of the people who read this are not professional barbers, and even though the magic clip is of very high-quality, many of its functionalities and settings can’t be properly utilized and understood by an average Joe. That doesn’t mean the thing would be useless for home use. If you want to learn how to properly fade and edge your beard with precision and adjustability that most supermarket-grade beard trimmers lack, by all means, get yourself a Magic Clip Trimmer. 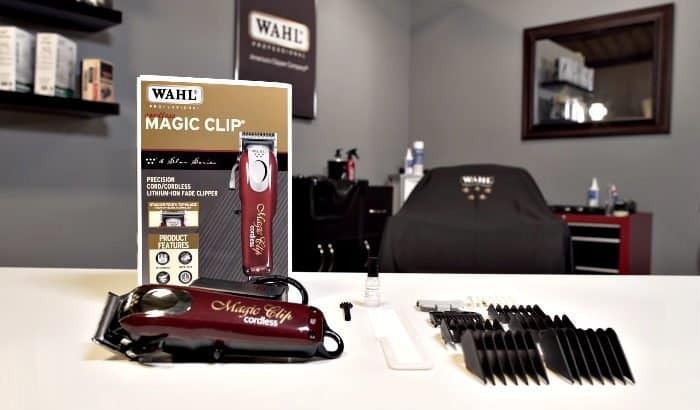 The Wahl Magic Clip can be used either cordless or with the power cord. When in cordless use, the Li-ion battery provides an above average trim time of 90 minutes. As to be expected, the trimmer also comes with 8 attachment guard combs, blade cleaning oil, and a cleaning brush. One of the most powerful rotary trimmer motors on the market. Patented “2161 blades” are regarded as the best among many professional barbers. The taper lever makes fading easier, which comes in handy if you aren’t a newbie. Some of the highest rated overall customer reviews on the big online distributors. Made for professional use, some of the functionalities are useless for an average Joe. At 10 oz, it’s not the lightest trimmer, though, the power must come from somewhere. Although not that of a big issue for most users, this Wahl beard trimmer is a bit noisy. Key Features: Corded/Cordless, professional-grade, Li-ion battery, high-quality patented blades, powerful rotary motor, trusted manufacturer. Q: What’s the best all-in-one beard trimmer currently available? A: It’s a close-knit battle between three good beard trimmers: The Wahl Li-ion, Braun MGK, the Panasonic one, and the Philips Norelco. After close examination, I would personally choose the Panasonic ER-SB40-K to be the top beard trimmer one from this review sample. Q: What is the best long beard trimmer on the market? A: For a longer beard, you might want to look into the Philips Norelco MG7750, which has one of the strongest blade motors out there. If you only do light trimming and mostly focus on detailing the cheek and neckline, then consider getting the OneBlade Pro. Q: Should I buy a corded or cordless facial hair trimmer? A: If you know that you will always trim your beard in your bathroom/toilet which has a power socket nearby, then choosing a corded beard trimmer will give you bit more durability, cutting power, and overall, more professional results. However, choosing a cordless beard trimmer gives you more freedom to trim wherever you choose and allows you to easily carry it with you when you travel, etc. Also without the cord weighing down the end of the trimmer, you’ll find that cordless beard clippers tend to be easier to maneuver. Q: Any good but cheap beard clippers out there? A: To be honest, most beard clippers are pretty good and do their job well, even the cheaper ones. One of the reasons why the Hatteker Men’s beard trimmer is constantly receiving top reviews is that it’s one of those “value” trimmers where the price and quality come together exceptionally well. Hence, it would be my recommendation for the best budget beard trimmer. Q: I’m looking for a small beard trimmer that’s good for travel use? A: The Wahl 9818 Lithium Ion Plus would be my recommendation for the best travel beard trimmer. It’s quite small, comes with universal voltage, has a travel case, and gives out an impressive 4-hour trim time for each full charge. Q: I hate changing the plastic guards, what’s the best adjustable beard trimmer? A: Definitely the Panasonic ER-SB40-K. There’s nothing I hate as much as constantly changing the clipper guards and its adjustable 19-length guard is, in my opinion, the perfect choice for men who want to keep it simple. Q: What is the best Philips trimmer for facial hair? 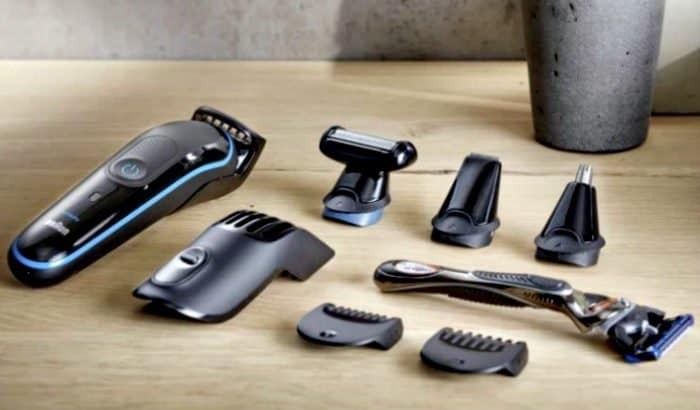 A: Philips makes tons of different trimmers in multiple model classes, and while you can find relatively good beard trimmers in all of them, the Norelco series is regarded as the “top tier” that Philips produces, and out of that the 7000 series is regarded as the best. Q: What are some professional beard trimmer models that barbers use? A: Most master barbers – at least to my personal experience with them and YouTube videos – use the Wahl Magic Clip and often do detailing work with the Andis T-Outliner. These seem to be the go-to beard clippers for pros, although every barber has their own preferences. Q: What are some beard trimming tools you recommend? A: To help with your face grooming, definitely check out our list of best beard scissors to help you out. Having a beard comb is also super helpful for free-hand cutting longer beards, and beard shapers & shaving templates are handy for the edge work. Q: What beard trimmer is best for stubble? A: There are specific stubble trimmers available, which I didn’t mention in this review. The Philips Norelco OneBlade Pro, however, works really well as a hybrid between the stubble trimmer and an electric beard shaver. Q: Can a beard trimmer be used to shave my head? A: Yes. The main difference between hair and beard clippers tends to be the motor power and blade with, but from the above options, most of the All-in-one trimmers like the Philips Norelco MG7750 can be used to cut hair as well. Q: How to sharpen a beard trimmer? A: The best beard trimmers come with self-sharpening blades, which pretty much never go dull on normal use. If you insist on getting a trimmer that needs manual sharpening, then you have to remove the blade part and use a coarse sharpening stone to the edges roughly 6-10 times at a 45° angle. Hope this ultimate beard trimmer review helped you choose the right gear for you. Whether it’s Wahl, Braun, Philips, Remington, or Panasonic; we are sure you are going to enjoy your new trimmer. And remember, trimming is just the beginning. There’s so much more that goes into beard care. You got the oils, the shampoos, the beard growth boosting supplements (yes, those exist for you – and real ones – not the scammy kind). When I had a beard, I preferred to use a trimmer by Philips (though I can’t recall the model name). Now, as I am writing this comment, there are dozens of prominent brands to choose from. I need your advice because I want to purchase a trimmer for my elder brother. Please suggest the best brand. I’ve learned so much from your site about beards. 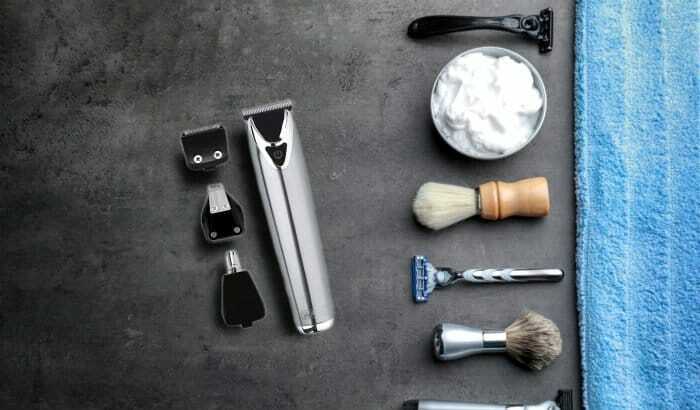 Having the right grooming gear will totally make it easier to groom like a pro. I will have a look at the trimmers suggested by you for sure. It’s all about the right tools for the right job. People are sometimes intimidated by trying something new (such as trimming their own beards), but don’t underestimate yourself. It may take a couple tries to perfect things, but you could surprise yourself by using the proper equipment. Just think—no more waiting to go to a barber and you can take care of your grooming needs wherever you are. For example, what if you go out of town for a week or more? Why risk trying an untested barber if you’re confident in the tools you possess and your skills. It’s a lot to consider. I had used some beards trimmers in the last 12 months but I wasn’t comfortable with them but having tried the Wahl lithium trimmer, I have a better experience and a better look. I totally recommend it. Trimming your beard is really no child’s play. It’s a serious business that requires quality tools and a sturdy hand unlike mine. I do visit the barbershop for a quality trim but I think some of these trimmers can actually help me get what I want without visiting the barber. Truly the top-rated beard trimmer line from the popular brand Philips, and also seen as one of the top-rated trimmers in the world. It is like the only brand I use and have never thought of switching to any other one anytime soon. My husband has been talking about getting a new beard trimmer for what seems like forever now. I am definitely going to show him this article to help him find his perfect trimmers! Yeah Philips Norelco Multi Groomer MG7750 is my number one on the list. Have read a lot of about it and I can also testify that it is a good one and I totally recommend it. FARI Multifunctional Beard Trimmer is super amazing and very affordable too. Quite easy to use with or without a cord, it actually comes with a neat stand and most importantly it cuts nose, hair, ear and facial hair. It’s a must have. Sure this ultimate beard trimmer review helped me choose the right gear for my beard. I’m looking at a Wahl or Braun product because I think it has the features I need.